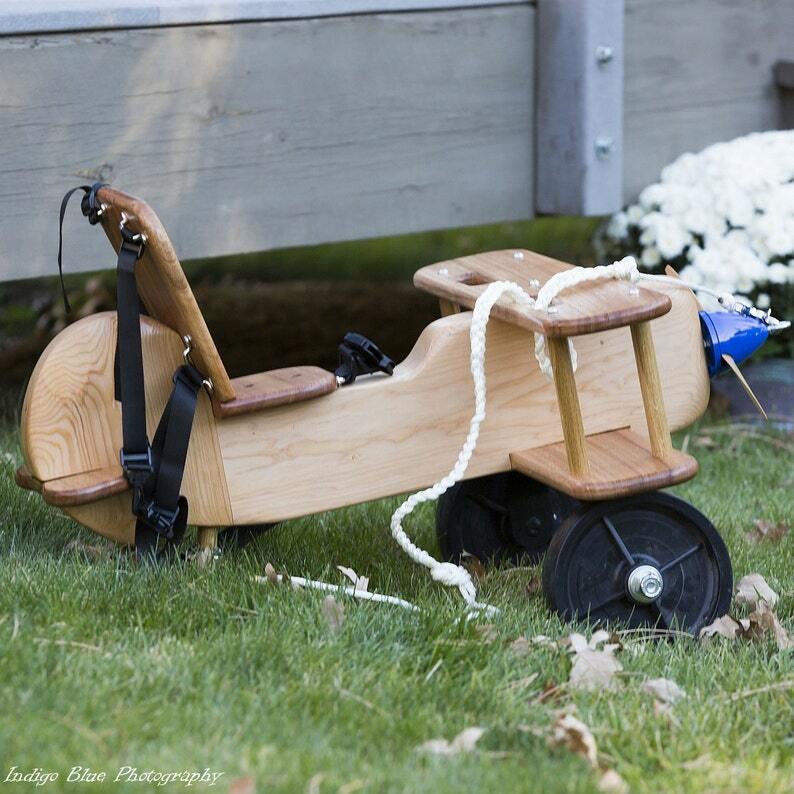 This listing is for one wooden biplane children's ride on toy with rocker capability. The plane easily attaches to a wooden rocker base or can be used separately so the child can scoot around. The rocker is sold separately. The main wheels do not swivel but the tail wheel swivels to allow turning while riding. The airplane is hand made of pine or other wood of my choice upon receiving your order. The wood will be sprayed with a clear finish to highlight the natural grain. It will take me approximately 2 weeks to construct your plane then ship it. As always, request custom to make changes and we can work through the details. Options could include colors, materials, markings, etc. Does not include the pull rope or harness and the rocker is sold separately. Propeller and spinner will differ from the photos. Seat Back to Handles: 14"
Orders generally ship each business day but orders placed late in the day may be shipped the next business day. Orders placed on weekends and holidays will ship the next business day. Custom orders will be produced according to the listing and shipped as soon as complete.